In 2006, an oddball group of bankers, traders and brokers from some of the largest financial institutions made a startling realization: Libor—the London interbank offered rate, which determines the interest rates on trillions in loans worldwide—was set daily by a small group of easily manipulated administrators, and that they could reap huge profits by nudging it fractions In 2006, an oddball group of bankers, traders and brokers from some of the largest financial institutions made a startling realization: Libor—the London interbank offered rate, which determines the interest rates on trillions in loans worldwide—was set daily by a small group of easily manipulated administrators, and that they could reap huge profits by nudging it fractions of a percent to suit their trading portfolios. Tom Hayes, a brilliant but troubled mathematician, became the lynchpin of a wild alliance that included a prickly French trader nicknamed “Gollum”; the broker “Abbo,” who liked to publicly strip naked when drinking; a nervous Kazakh chicken farmer known as “Derka Derka”; a broker known as “Village” (short for “Village Idiot”) who racked up huge expense account bills; an executive called “Clumpy” because of his patchwork hair loss; and a broker uncreatively nicknamed “Big Nose” who had once been a semi-professional boxer. This group generated incredible riches —until it all unraveled in spectacularly vicious, backstabbing fashion. 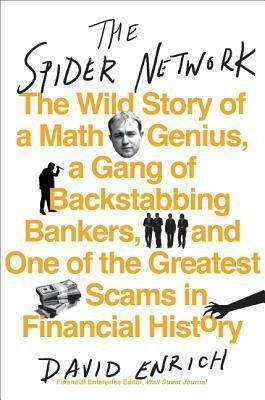 With exclusive access to key characters and evidence, The Spider Network is not only a rollicking account of the scam, but also a provocative examination of a financial system that was crooked throughout.